Brush coat, make sure hooves are polished and maybe pack a bale of hay as a snack. Not the usual drill for parishioners at Greyfriars Kirk, but this Sunday will see a special pet blessing ceremony for animals including cats and dogs – and a possible appearance of a Shetland pony. The church will be throwing open its doors to welcome up to 50 animals, with the majority of the shaggy-coated congregation likely to be Skye terriers. 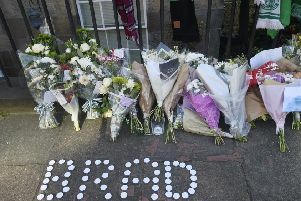 The Church of Scotland site has a strong connection for animal lovers, with thousands of tourists visiting the grave of Greyfriars Bobby and many leaving a stick at his headstone. Bobby, a Skye terrier, became famous worldwide after keeping watch over the grave of his owner, John Gray, in the churchyard for 14 years until his own death in 1872. Some of the dogs attending are expected to be wearing coats made from Greyfriars tartan, designed in 2011 as part of the Grassmarket Community Project which helps vulnerable people develop new skills. Hymns at the service, to be held at 3pm and conducted by Lezley Stewart, associate minister, will include All Things Bright and Beautiful – chosen for the line “all creatures great and small”. The Rev Dr Richard Frazer, Greyfriars minister, who conducted Scotland’s first pet blessing at the church in 2013, said: “The pet blessing is growing in popularity. Dogs are the most common animal to be brought along by their owners because the event is in conjunction with the Skye Terrier Club, but it could be any kind of pet – we’ve been told there might even be a Shetland pony this year. Vicki Larkham-Jones, vet for the PDSA animal veterinary charity, said: “The rise in popularity of animal blessings just highlights that the bond between people and their pets has never been stronger.